Yes, the books from the 1980s Sesame Street Book Club are cool, they remind me of the heyday of Jim Henson and Sesame Street, and they’re an amazing value for your dollar. 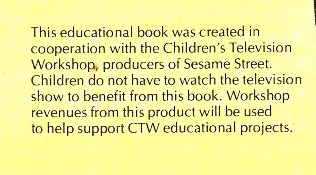 BUT, with all that said, my favorite thing about the Sesame Street Book Club might be this disclaimer that ran on the back covers of most of the books. Children do not have to watch the television show to benefit from this book. I don’t know why that sentence tickles me to my core, but it does. It just seems so earnest and idealistic. Can you imagine picking up a Spongebob Squarepants, Scooby Doo, or Clone Wars easy reader at a bookstore and seeing a disclaimer on the back that says, “Hey, if you haven’t seen the cartoon, no worries. We tried to make this a great standalone book anyway”? But, bless their hearts, the creators behind the Sesame Street Book Club titles weren’t just trying to create another ancillary revenue stream. They were, honestly and truly, trying to make engaging, exceptional kids’ books. They were trying to tell stories, teach the alphabet, and help kids learn, first and foremost, and the fact that the characters came from a popular TV show was just icing on the cake. Yes, I’m sure money was made and the corporate side of the Children’s Television Workshop was anxious to get some books out there for parents to purchase, BUT they didn’t let their quest for the almighty dollar completely drive their content strategy. The Book Club could’ve just tossed out cheap transcripts of popular Sesame Street sketches – The Rubber Duckie Song: The Book or These Are the People in My Neighborhood: The Reader. Instead, they actually decided to TRY – they chose to try to make some really smart, educational books, even though they didn’t have to. And that’s admirable. It’s a little disturbing how strange that idea seems in the current age of platform synergy and leveraging content assets, but it gives me yet another excuse to indulge in my nostalgia for vintage Sesame Street arcana, so I’m just going to look at that beautiful disclaimer, think about Mr. Hooper, and smile. Aww I love this post, Tom! I loved the Sesame Street books as a kid, and this was a great reminder of their very wholesome message. Really lovely writing, Mr. Burns. You’re too sweet, Kristina. Thanks!